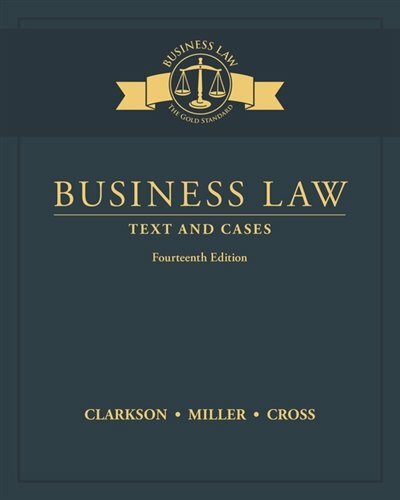 1305967259 -Comprehensive, authoritative, and student-friendly, market-leader Clarkson/Miller/Cross BUSINESS LAW: TEXT AND CASES, 14E delivers an ideal blend of classic “black letter law” and cutting-edge contemporary issues and cases. The first text to implement an undergraduate-oriented pedagogy with traditional law school-like content, BUSINESS LAW, 14E continues to set the standard for excellence. The book’s strong student orientation makes the law accessible, interesting, and relevant. Cases, content, and features throughout this edition are thoroughly updated to present the latest developments in business law. Cases range from precedent-setting landmarks to important recent decisions. Ethical, global, e-commerce, digital, and corporate themes are integrated throughout with new features, such as new Digital Updates that highlight how digital progress is affecting the law. In addition, numerous critical-thinking exercises challenge students to apply their knowledge of law to real issues.